My Con Experience, by Alex, aged… quite enough thanks. It was Craftonomicon, the 51st National Australian Science Fiction Convention, this weekend, and the first weird bit about it was that I got there by taxi, and not by plane. My con started properly on Friday afternoon with a panel on space opera with m1k3y and Jonathan Strahan that went remarkably well, not least because the former was an admirable moderator. I got to gush about a few books and discuss why I like it and what makes something space opera; Tansy thinks I am very harsh because I said generally it has to move outside of the solar system. I say: if it doesn’t, it’s hard to be grand enough to count. Next I helped Terri and Alisa move a mountain of cupcakes in preparation for Twelfth Planet Press Hour, in honour of two new Twelve Planets books and Jason Nahrung’s Salvage, and TPP in general. The cupcakes were wolfed in minutes, although it is fair to say that people did usually stop for a moment to admire the artwork that Terri had made of them out of frosting and sugar. So very much sugar. I think Friday ended with dinner, and… I forget. It was a while ago now. There was a great deal of talking. Actually that was kinda the theme of the whole con. The official theme was craft, and I got a number of inches completed on my scarf; the unofficial theme was Talk As Much As You Can. Me and my peeps managed this quite well 😀 . In the afternoon we did a Galactic Suburbia that lasted just ONE HOUR – show notes to come when the Silent Producer has recovered from the con. After that I travelled with Alisa and nine of her Planets (and a few other audience members) to Embiggen Books, which oh my it might have been better for me not to find. What a BEAUTIFUL bookshop! With a door hidden as a shelf and everything!! Mondy hosted the podcast that involved all nine Planet authors and Alisa talking about the project and their individual approaches to it, and it was a lot of fun to sit in the audience and listen to such a diverse range of women talk about their approaches to writing and to the project. Drinks and dinner followed, and I got home… later than Friday. Sunday I made it in to the con in time to see half of the “Elizabethans are awesome” panel, and then wandered around and helped restock the Twelfth Planet table and generally mooched and chatted. My last panel to contribute to was one on book blogging and reviewing, which went ok. I scurried from that to the live recording of The Writer and the Critic, which was entertaining of course even though they did not especially like Crystal Singer, by Anne McCaffrey, which I adored in my teens. The evening was taken up with dinner, trying to find out when power might be restored in Perth, and then frocking up because it was Awards Night! And I love awards. It was the Chronos (Victorian state) and Ditmar (national) awards night, with a couple of others thrown in – mostly lifetime achievement type things, plus the Norma K Hemming, for a book which addresses gender/class/disability issues. I won’t go into all of the winners – that would be a Galactic Suburbia job! – but I will proudly mention that I won two! I got the Best Fan Written Work for Tiptree, and a collection of her short stories, which thrilled me immensely. And then… then, they announced that Tehani and I won the William Atheling award for criticism for our conversational review series of the Miles Vorkosigan novels. This thrilled me absolutely to bits, and if there hadn’t been lots of people there I may even have had a tear in my eye. The rest of the night involved much talking and laughing and a midnight run for ice cream…. Monday was hard to get to, mostly because it was a public holiday and my tram never showed, so I ended up driving in so that I could catch Alisa, Terri and Jonathan before they winged their way back to Perth. I managed it, and then I went to a panel that was officially meant to be about whether women are equal to men in sf and fantasy, but ended up ranging over a variety of mostly interesting topics. After a spot of chatting and lunch I concluded my con with a panel on “The Awards Debacle”, which was sadly lacking in any controversy because the panelists all agreed with each other. Now, I am tired, but not as tired as those who had to actually travel to get home; I am anticipating an early night before returning to the so-called real world. But this con has been a seriously awesome experience: lots of talking, lots of knitting, lots of talking. I met a couple of people I only know via the ether, which was great, and it was really wonderful to spend face to face time with the people I talk to so often but so rarely get to experience with body language! We all had ‘the con voice’ by Monday morning – dropping about an octave – partly from aircon, partly from late nights, partly from talking too much but only just enough. And that’s my con-going for the year. 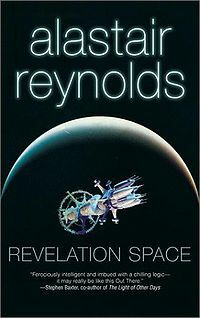 It’s another awesome space opera from Reynolds. One of the things which I had misremembered – and perhaps it applies more to one or both of the other Revelation Space books I’ve not reread yet – is the amount of cross-over between the stories. There are some allusions to ideas and people from Revelation Space here, but they are both very definitely stand-alone novels. And I like that; it’s a universe, rather than a series. I really liked that it ended with Tanner clearly talking to Khouri, which is one of the opening scenes from Revelation; it felt quite neat for readers of both books. This book has quite a different feel from Revelation, which is interesting to see – to change from just your first to your second, particularly within the same universe, seems… game? Anyway, it is largely told with a first-person narrator – with occasional flashbacks to an historical character – and consequently the story is mostly linear (with the exception of those flashbacks, and the narrator’s own thinking about his past). I enjoy a narrator – particularly one, as in this instance, who is a bit unreliable. In fact I enjoyed most of the characters in this novel; there aren’t many, with the exception of the narrator (Tanner) who are particularly deeply developed, but they are certainly all individuated without becoming cliches. There’s a nice range of female and male characters, doing a range of different activities and with a range of different motivations – I think I said a similar thing about <i>Revelation</i>, but it’s true and it’s one of the appealing things about Reynolds. The settings for Chasm are great. We’re in about the same time period as in Revelation, so chunks of the galaxy have been colonised, but there’s no FTL so getting places is still damn hard work. There are two prime locales: Chasm City itself, of course, on the planet Yellowstone, and the planet of Sky’s Edge. These are two radically different places, so Reynolds gets to indulge in two quite different visions of what interplanetary colonisation might look like. In thinking about that issue, I utterly adored the slow revelation about how the colonisation of Sky’s Edge came about; the slow generation-ships thing is enthralling, for me, and thinking about the lengths people might go to to get an edge is intriguing. I particularly enjoyed the slow but steady revelation and discussion of Sky Haussman’s character; that you start the novel knowing he was characterised as both a hero and a villain, and slowly that image is problematised… yeh, it really works for me. And Sky’s actions of course present an immense ethical quandary – which the reader can’t help but approach with the knowledge that it caused a centuries-long war on the planet itself. Chasm City, of course, is a wonderfully outrageous city, and I loved that Reynolds opened with an excerpt from a document explaining how the city has been affected by a plague – so the reader has that extra bit of information, and thus an advantage over Tanner. For me, it heightened the sympathy the reader could feel for him. And the plague itself iconic: something that affected the machinery of the place doesn’t seem disastrous, until you remember that this is a society using nano, with therefore machinery in everything – and everyone…. There are so many possibilities inherent in that idea. The plot itself has a kinda revenge tragedy thing going on, which can be a bit tedious but in this instance is skilfully drawn out and well played, too. In fact there are numerous side-plots that at times could threaten to overwhelm the central point – the revenge – but ultimately Reynolds draws them all together and reveals that actually, he knew what he was doing all the time (of course). It’s another of my favourites. Not quite as comforting as Revelation, in that the stuff about Gideon is rather off-putting, but familiar and relaxing nonetheless. And a damn good story. I just love this book. I really really do. I seem to remember that when I first read it, I found it a bit confusing – albeit in a good way – because there were lots of POV changes. I wonder now whether that’s one of the other books, because while there are flicks between POVs they converged more rapidly than I had expected and the connections seemed more obvious… but perhaps that is actually a function of me remembering, if barely, where at least some of the connections lay. One of the great things about having a relatively poor memory is that having read this some 5 or 6 years ago, there were stacks of things that there were once again a total surprise for me. There’s a nice variety of characters here. Male and female, baseline-human and definitely not, and a mix of motives and attitudes. I have two favourites, and they’re the two most obvious: Sylveste and Volyova. Sylveste because he’s just a bit like Indiana Jones; he is, after all, inherently an archaeologist, who gets caught up in adventures. He’s also one of the most sublimely arrogant characters out there, in that fascinatingly entertaining way that only someone who is right so often that the arrogance seems appropriate can get away with. Like House or Holmes, I guess. Not quite diametrically opposed, but still radically different, is Volyova. She’s not quite a sociopath but she’s way more at home with weapons than other people. She gets some wonderful lines in the book, and I always enjoyed the sections told from her perspective; Reynolds gave her a marvellously dry wit and a drive for achievement as strong as Sylveste’s, with marginally less arrogance. I quite liked the POV switches, actually, even – perhaps, bizarrely, especially when – they were done seemingly mid-action sequence. The switch always added something to the scene, an understanding or a perception that could not have come from the initial character. I also liked that there wasn’t an omniscient narrator; it meant that events and revelations came slowly, ambiguously, enthrallingly. The plot? Oh, the usual; humanity spread across the galaxy, encountering alien artefacts but where is everybody else, along with tantalising hints at what has happened to humanity as they spread – the alterations to baseline humanity are some of the intriguing of those; I love the Ultras and their chimeric alterations, heading towards being truly cybernetic beings. There are small-scale dramas and intrigues – love, abandonment, family drama – mixed in with the galaxy-impacting revelations, making this a seriously awesome representative of space opera. In fact it might have been the first book I ever read that made me genuinely consider space opera a sub-genre, and realise that I totally adore it. It might not be the absolutely most original plot in the world, but the revelations at the end were certainly new ideas for me, and the writing itself is so complex-but-clear that it doesn’t matter that it’s a play on the Fermi paradox; as an SF idea I think it has plenty of scope left anyway. I have been waiting for this book for a long time, not least because I had thought it was a trilogy, rather than a quadrilogy. Here, we finally get a conclusion to the intricate plots that de Pierres has been developing and tangling over the series: Mira Fedor and her pregnancy, Trin and his semi-willing followers on Araldis, Tekton and his bizarre free-mind/logic-mind… and my favourite, Jo-Jo Rasterovich, the deep-space miner irrevocably changed by his encounter with the entity, Sole, who – it becomes increasingly clear – has something to do with everything that’s going on. In terms of plot, there is little that is absolutely new in Transformation Space. It’s a book of climaxes, of revelations, of explanations and conclusions. That’s how it should be, and it certainly doesn’t mean that it’s boring. As with the preceding three books, de Pierres writes a relentless action story, with few breathing spaces for the characters or the reader. This is unsurprising, given that Mirror Space concluded with the revelation that a Post-Species fleet was moving into Orion space, and the suggestion that this was somehow connected to the invasion of the planet Araldis. The use of multiple strands of narrative, used to such great effect in the previous books, is continued here; and even when the narrative swings over to Trin and his followers, forced to hide away and spend all their energy hiding and foraging, it’s not exactly relaxing, as tempers run high and eventually boil over. Other strands are more event-based. A new strand is introduced, that of Balbao, in charge of the installation commissioned to examine Sole; things go radically wrong, leading to them eventually teaming up with Lasper Farr. (Anyone familiar with the preceding books will know that such a match is bound to end badly, or at least chaotically.) Even Mira gets a fairly action-oriented story, as she gives birth and then must decide what she and the biozoon Insignia are going to do about the Post-Species fleet and Mira’s own planet. While occasionally in the other books it was sometimes disorienting to switch rapidly between characters and places, I was fairly comfortable with it by this stage. Plus, there was more convergence than ever, with various characters finally coming together or with storylines coming to a natural conclusion. The characters are a fascinating aspect of this series for me. Half the time I can’t figure out whether I care about many, or indeed any, of them. I have never found Mira particularly engaging as a character; although sympathetic, I was frequently annoyed at what I saw as a lack of gumption. I was pleased that this book finally saw her exercising more agency, and holding her own against various other forceful personalities. This development makes sense, too, over the story; coming from a restrictive world like Araldis, a feisty female character would have been unbelievable. As she is away from that environment for longer, and is exposed to different attitudes and forced to look after herself, she responds and grows appropriately. As for the other characters: I have never felt much sympathy for Trin, the spoilt little rich kid forced to become a leader, and that didn’t change. Tekton, the arrogant tyro drawn away from studying Sole, continued to be repulsive yet oddly charming (a description I’m quite sure he’d be immensely flattered by), and I really enjoyed that he was even more active, rather than largely reactive, this time. The same cannot be said, I think, for Thales, who continued basically to be the hapless scholar; although he is involved in important events, he rarely seemed to be directly involved with them. Rather, he was more like flotsam on the tide, being pushed around and only occasionally interacting. This actually makes him quite an interesting character, I think, given how rarely such a character is male – and an educated male at that. There are other characters, of course, but it would be boring to go through all of them; they are marvellously varied, with few stereotypes and frequent surprises. I just don’t find many of them actually likeable. This makes it quite odd, I guess, that I really enjoyed this book and the entire series. It’s a tribute to the skilful writing, and the utterly intriguing plot. 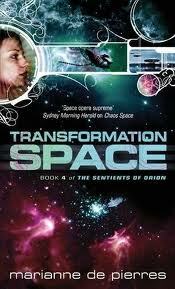 The Sentients of Orion is a complex, highly textured and riveting space opera. It’s set across an entire galaxy populated by ‘humanesques’ and other, more alien beings; the action veers from intense family drama to planet-wrecking destruction. It considers genetic engineering, religion, politics, personal responsibility and the different forms love can take. It’s both character and plot-driven, and the conclusion totally astounded me. This is a series that has changed my way of thinking about space opera, and the characters that populate it. I got to read a review copy of Godlike Machines a while back, and fell totally in love with it. It’s finally, finally, been published, so I get to talk about it!! I am so in love with Big Dumb Objects. And Small Dumb Objects. And grand, time-spanning, galaxy-sweeping space opera. Godlike Machines was, basically, written for me. The opening story is “Troika,” by Alastair Reynolds. Told be a cosmonaut to an old woman, Nesha, it details humanity’s reaction to an astonishing object appearing in our solar system – the Matryoshka. Reynolds has delicate character development, gripping plot development, and an all-too-real visualisation of near-future Earth. This story made me sigh with pure pleasure. A novella, it could easily be a full-length novel; in some ways it reminded me of Clarke’s Rama sequence. I have nothing bad to say about the characters, or the narration, or the climax. This one goes straight to the pool room of All Time Favourites. Stephen Baxter’s “Return to Titan” was perhaps not as infatuation-producing as I have not yet read any of the Xeelee sequence; but it’s still a good yarn, about going to Titan – obviously; the reasons for doing that and the weird things the explorers discover. The characters were intriguing, and not very likable overall. Cory Doctorow’s “There’s a Great Big Beautiful Tomorrow” seemed a bit aimless, after the first two which have such strong, driving, and relentless plots; still the characterisation is a marvel, and some of the ideas are breath-taking. Having recently read “A Map of the Mines of Barnath,” I was immensely pleased to read “A Glimpse of the Marvelous Structure” by Sean Williams. This one goes up alongside “Troika,” for my money; the characters are drawn sparsely but believably; the plot unfolds gently, relentlessly, and suprisingly; and – and – I just loved it! How can you make a story about a BDO sad and poignant?? Robert Reed manages it in “Alone,” but I’m still a bit bemused. This is another story going straight to my favourites list… a machine on an enormous ship, alone for enormous swathes of time: would it want to know its provenance? Is it possible to be self-contained to such an extreme, for any sentient? *sigh* it’s just wonderful. And finally, Greg Egan’s “Hot Rock” is yet another take on what exactly a godlike machine could be. In this case, it’s a planet. Explorers from two different worlds come together to a wandering planet, which – despite having no sun – still manages to be balmy and atmospheric. Once again interacting with aliens is the theme of the day; managing your own prejudices and expectations, and figuring out how to make the best of a situation for everyone involved. In this case, it was the action that pulled me along; the characters are interesting enough, but not quite at the same level as Alone or Reynolds’ cosmonaut. Basically, this anthology has ruined me for space opera for a while. It will be hard for anyone else to compete. From Mind Meld – it’s worth read in full if you like space opera; they’re answering the question of how to keep space opera relevant. Me, I say: who cares about relevant?! I like what Tobias Buckell says, too: “massive spaceships, planets with two suns, big dumb objects (the deathstar), giant space battles, plucky heroes and larger than life settings.” Yeh! Woohoo! I don’t even know who Buckell is, but now I might have to find out.